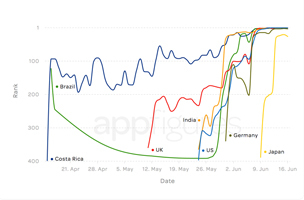 World Cup fever is at its peak, and soccer apps are experiencing similar popularity – even apps not sponsored by the official FIFA organization. Apps like FIFA Official App, Watch ESPN, Univision Deportes are all popular free iOS apps, while Univision Deportes is in the top ten in Google Play. With many days left of the games, these apps will still get plenty of utility. Univision Deportes and watchESPN, two apps that offer live streams of first-round matches, have kept pace with the official FIFA app. As of June 16th, these three are ranked one, two, and three in the US Sports category as well as one, three, and seven in the US Top Overall category. In addition to its huge popularity, the FIFA app is also quite popular among iOS users for its clean, intuitive design. Unfortunately, Android users are not experiencing the same, as many users have complained about the bloated app that is also prone to crashing, but this could be due to the large variations in Android devices and operating systems. Either way, FIFA is winning in the apps category. Is FIFA really the best sports app ever made? I usually don’t review apps, but I’ve got to hand it to whomever wrote this app: IT’S GREAT!!! They actually put the time in to make a very comprehensive & well-flowing app. Probably the best sports app I’ve used. I’m constantly using it. And thank you for not ruining it by poorly-placed ads. You guys/gals should help ESPN, NFL, CBS Sports, etc. & all the other major sports apps to make great apps like this one. Thanks for making the World Cup an even more enjoyable experience. Seriously, I have never before seen an app this well thought out and designed. Teams info/rankings, group standings, live score tracking in detail, world wide social media tracking of team support (you can vote for which team will win each game), updated and detailed World Cup news, beautiful layout, host country history and info, and more! Simply amazing. As perfect as an app can get. Thank you creators, thank you Fifa!